Giant Helleborine is a large, perennial, rhizomatous orchid species that in North America is found in the western half of the continental United States and in one Canadian province (British Columbia) (USDA 2011). In British Columbia, it is found in the southern part of the province, in "moist streambanks, fens, marshes and swamps, and around hot springs in the lowland and montane zones" (Douglas et al. 2001). Perennial herb from short rhizomes and clustered, thickened roots; stems 30-100 cm tall, leafy, sparsely hairy. Stem leaves lanceolate to widely elliptic, 5-15 cm long, ribbed, gradually reduced upward and downward. Inflorescence terminal, somewhat 1-sided, of several showy flowers, the bracts leaflike; sepals green to reddish, purple-veined, lanceolate to egg-shaped, 12-20 mm long, the lower sepals spreading to descending; lateral petals similar to sepals, 13-15 mm long, ascending or curved forward; lip 14-20 mm long, saclike at base, 3-lobed, lower half deeply concave, greenish to yellowish, red-purple-veined, upper half grooved, yellow, reddish-tinged or -veined below; column 5-9 mm long, curved over lip. Capsules, ellipsoid, spreading to drooping, 2-3 cm long. Moist streambanks, fens, marshes and swamps, and around hot springs in the lowland and montane zones; rare in S BC; S to TX, NM, AZ and CA. 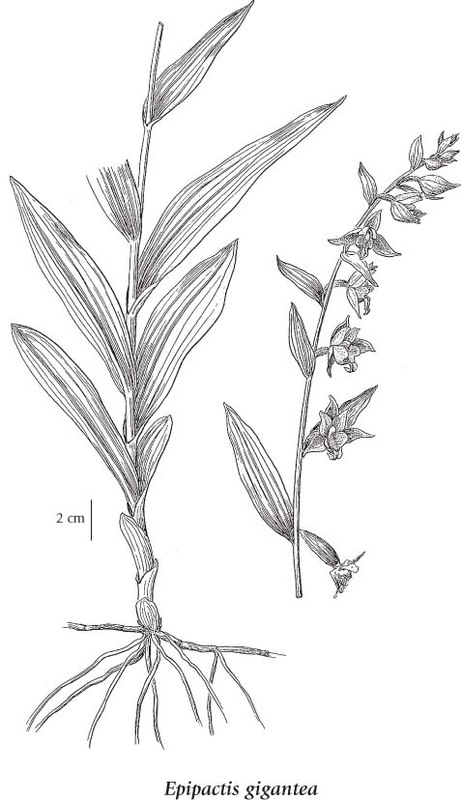 Epipactis gigantea is a distinctive species which can only be mistaken in the wild for the introduced species Epipactis helleborine (Brunton 1983). A number of key characteristics separate these two species. The flowers of E. gigantea are large, the sepals and petals are 12-20 mm long, and the lips are 14-20 mm long and grooved to the tip (Douglas et al. 2001). The flowers of E. helleborine are smaller, the sepals and petals are 8-13 mm long, and the lips are 10-12 mm long and more or less flat above the middle (Douglas et al. 2001).